The Healthcare Data, Technology & Services Blog: Why Follow a #HIMSS16 Social Media Ambassador like @ShimCode? 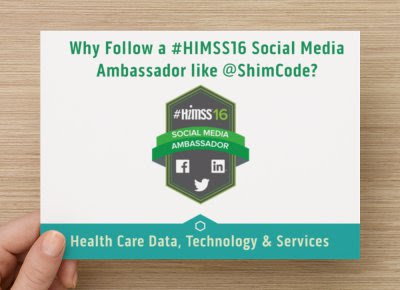 Why Follow a #HIMSS16 Social Media Ambassador like @ShimCode? Simply put: To get good content and a variety of information from the 2016 HIMSS Conference in Las Vegas without having to sift through all the advertisements, spam, stale and repeated tweets. By following me and other HIMSS Social Media Ambassadors, you’ll get timely tweets about conference happenings. Those not attending the conference will have an enhanced means to monitor what’s going on at the conference. How Will Tweets that I Share be Selected? Twitter, popular blogs and other sources of information are monitored using various automated and manual methods using terms and phrases expected to be of prominence at the HIMSS conference. A human with 20+ years of experience in the healthcare IT and services industry will review each tweet before it’s shared. 3. Monitor alternative sources of information off Twitter’s beaten path. These include blogs, content made available to me personally, via various contacts, associates, and search mechanisms I use. 4. Include links to supplemental content and resources associated with certain tweets. 5. Verify any embedded links and embedded content can be accessed. 6. Share select vendor info (whitepapers, surveys, content, offers, etc) that are not clearly a sales pitches. Thickly veiled sales pitches will probably be shared. 7. Spare you the excess of the “over-tweeters.” With few exceptions, you will only see a specific tweet or content item one time - not over and over and over like some people do. 8. Share select info on "booth-bling," tweet-ups, free food,/drink, parties and contests. 1. Share the same tweet over and over and over again. Except for periodic “promotional tweets” to call attention to the service this account provides. 2. Retweet every tweet mentioning this account. This isn’t about me. I'm doing to because I want to share good good healthcare IT info related to the health information technology conferences. So consider following me @ShimCode and the entire list of 2016 HIMSS Social Media Ambassadors.